Our Slim Official Rectangular Notary Stamp is portable and silent when in use. It is a discreet and durable notary stamp of seal. Our Slim Official Rectangular Notary Stamp is guaranteed to not only turn heads in the office but also guaranteed to meet all state board specifications. Both you and your client will be impressed with how crisp and clear every impression is with your Slim Official Rectangular Notary Stamp. 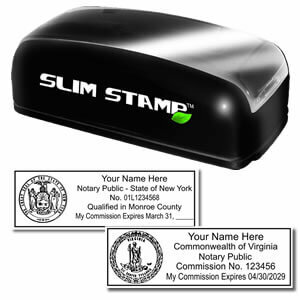 Unsure if the Slim Official Rectangular Notary Stamp is the correct stamp for you? Contact Us! As a notary public, you will receive many different types of documents to notarize. Some documents have plenty of room for the imprint of your notary seal and some documents only leave the notary room in the margins. We understand that issue and that is why we created the Slim Official Rectangular Notary Stamp. Designed to fit within the margins of heavily-worded documents, this Slim Official Rectangular Stamp is guaranteed to meet all state board specifications. You and your client will love the clean impressions you will receive with each stamp on the page. Is this stamp approved for my state? Diversity is a huge staple in American culture. Diversity is also extremely prevalent within the state specifications for notaries. It is critical to carefully read your state-issued notary handbook before purchasing supplies. Some states require or may even prohibit certain sizes, shapes and the use of state seals. Notary Supplies Online keeps a careful eye on all incoming orders and all of the ever-changing state board guidelines to assure that your products will always meet your state's requirements. If you are ever unsure about what product to purchase or what is allowed in your state, please contact us. We will try our very best to answer every concern you may have. It is our passion to not only create premium stamps but also to create long-lasting customer relationships.